For any of my gals in the midst of wedding planning, stay strong... you've got this! I remember thinking to myself "I have to figure out all the minute details of program fonts, welcome bags, and tablescapes PLUS do everything I can to make sure my skin is GLOWING and blemish free on wedding day? Ain't nobody got time!" Somehow my always-blemish-free fiance got the good end of the deal but that's neither here nor there. Today, along with my amazing esthetician, I'm sharing everything we did to prep my skin for wedding day. Remember, I planned my wedding in 4.5 months so if you feel like you don't have enough time to improve your skin, you've got time baby! Step 2: find an incredible esthetician (hi, Molly!) who will learn the ins + outs of your skin and educate you on all the treatments that could benefit you on wedding day. Note: I've been going to Molly for a little over 2 years for monthly facials and she has changed my skin entirely especially with LED treatments for Acne (more on that later). If you don't have a facialist, chances are your friends do. Ask around and definitely go off referrals. Timing: The goal is to get 6 treatments in before the wedding date. Ideally starting 3 months out and coming in every 2 weeks. Treatments: It's always fun mixing my treatments and potions and coming up with something that gives results and makes my clients happy, beautiful and confident. Especially when time is a factor. Lets face it, sometimes we tend to wait until the last minute and then want someone to perform miracles. I'm not performing lifetime miracles. I'm performing right now miracles. Treatments to get you through moments in life when looking your very best is what counts! Not to say these treatments don't or wont last! That's up to you. Like everything and anything, skincare takes commitment and maintenance. To achieve Ashley's clear, glowing skin I used facial techniques and machines I have been working with and perfecting for years. With these techniques you will walk out feeling younger, more beautiful and confident with a glow that lasts! The Details: It's important to note that these are a combination of treatments that Molly put together as my ultimate glowing skin treatment; there's really no name for it. Talk to your esthetician about them individually and how they will benefit your skin as a whole. The best part about each of them: THERE IS ABSOLUTELY NO DOWN TIME! Cleanses, exfoliates, purifies, and hydrates the skin. This is what I've been doing monthly for the past 2+ years and it has helped my skin immensly, especially in the acne department. A "natural” facelift of sorts. A device emits extremely low-voltage electrical currents, which mirror your own body's electrical currents, on a cellular level to repair damaged skin, stimulate collagen, elastin production, and tightening and lifting the facial muscles, giving skin a firmer look and feel. Madonna has been scene doing this on her IG stories... so, there's that. Color Light Therapy that uses four clinically proven wavelengths of UV-free LED lights to boost collagen production and treat existing acne. This has been a game changer for my acne over the last two years. If you're struggling with mild acne I cannot suggest it enough. This is done by facial massages and a device called the Balancer Pro (a lot of athletes use this). The process clears out lymphnodes to rid you of any bloating or water retention, stimulating oxygen and blood flow. The best skincare regimen for clear, glowing skin on wedding day. 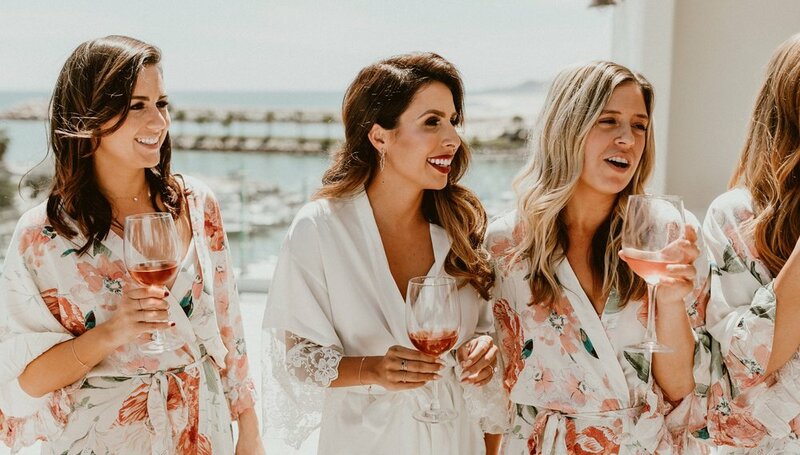 Ashley + Andy Wedding ACRE Baja. Photos via: Gina + Ryan Photography | See more wedding photos here! I can 100% say that during my wedding weekend my skin + face looked and felt the BEST it ever has. Once we got our wedding pictures I noticed it even more, especially since I've obviously cut back on my skincare regimen since wedding days. The reality is a treatment regimen like this takes a ton of commitment and is not cheap. Is it worth it? Yes! We did a combination of most of the above every two weeks and it took about 2 hours each time. I'm a little embarrassed to say that I just wouldn't look at the bill because I knew the outcome would be priceless. As someone who has struggled with acne their whole lives, ESPECIALLY during stressful times, all I wanted was to be blemish free for my wedding. And truly blemish free. Not spot treating the night before, not feeling something growing under my chin day-of, afraid it was going to peak out mid-reception ... 100% clear. And it was! I'm legit tearing up as I write this because I truly felt so confident and beautiful during our wedding weekend. Btw, the clear skin glow lasted a good 2 months (through my honeymoon!). In regards to pricing, it honestly varies by skincare specialist and location. It's safe to say facials in Beverly Hills are going to be more expensive then those in Indianapolis. My suggestion is to find someone you trust who won't try to up-sell you on treatments you don't really need. Be honest about your wedding skincare goals and prioritize treatments based off that. If I had to pick two of the 5 treatments I listed above I would go with the oxygen facials + LED treatments because acne was my #1 concern. About Molly: Molly is a Licensed Esthetician/Skincare Specialist and has been working in the skincare industry for over 18 years. Molly’s training, experience and specialty is in Medical and Cosmetic Dermatology, mentoring under renowned dermatologists. You can find her at Lasky Laser Center in Beverly Hills. Personal note: she is THE BEST and I cannot recommend her enough!